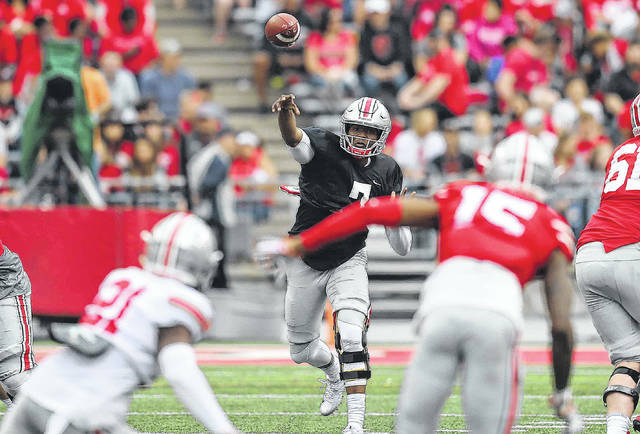 Realistically, it is probably a two-man competition between redshirt sophomore Dwayne Haskins and junior Joe Burrow with first-year player Tate Martell making a pitch for playing time based more on his athletic ability as a runner than being a polished QB. Burrow went into preaseason practice last season listed as the back-up to four-year starter J.T. Barrett but when he suffered a broken hand in late August the depth chart was rearranged. • The game goes on: Meyer said he was happy the spring game was played despite an ominous weather forecast earlier in the week that led Michigan and Wisconsin to cancel their spring games. • Attendance numbers: Ohio State sold 79,000 tickets for the spring game but the announced attendance was only 47,803. 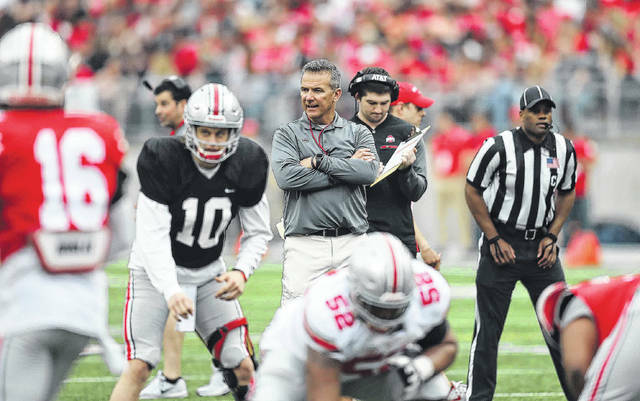 Head coach Urban Meyer watches as Joe Burrow (10) prepares to take a snap during Saturday’s Ohio State spring game at Ohio Stadium in Columbus. Dewayne Haskins throws a pass during Saturday’s Ohio State spring game at Ohio Stadium in Columbus. The Scarlet team’s Master Teague bursts through the line during Saturday’s Ohio State spring game at Ohio Stadium in Columbus.